This site's made my day - the Warm Showers concept has been around since the early nineties but has only recently become a fully mappified website. If only we'd known about it sooner. When you sign up, you are joining a network of people who offer accommodation facilities to touring cyclists. 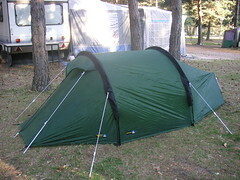 You can choose what you offer, from a camping spot on the lawn to full B&B service, and dictate your own terms. In return, you get access to everybody else on the network for accommodation when you're touring, and the hopeful excitement that maybe somebody will take you up on your offer. The idea of letting a stranger into your home might make some people a bit uneasy - I think people are quite wary about doing so, and there are some good reasons out there, but those good reasons are few and far between and being afraid of them is really not very constructive. While travelling last year we were often helped by kind strangers who helped us find somewhere to stay or somewhere to eat, or just pointed us in the right direction. The most amazing of those was being given the key to the home of a Portuguese family within fifteen minutes of meeting them, along with an invitation to live there rent-free, and apparently without a moment of worry on their part about what kind of nutters we were. There's not really enough people signed up to the Warm Showers network - we've done our bit. You don't even have to be a cyclist, just willing to help somebody who needs a place to stay. We're looking forward to hearing from our first cyclist! We really, really wish we'd known about this one when touring the Netherlands, as the hotels were so expensive there. Friends of the Bicycle will send you a list of thousands of addresses in Belgium and the Netherlands where homeowners will give you B&B for a maximum of 17euro per person per night (You'd be lucky to find a double room in a hotel for under 60) and optionally a packed lunch next day for up to 4euro. There's a membership fee of 9euro but that'll pay for itself several times over in just one night. This one's for bikers and hikers. Cycling route planner based on Google Maps. Click points on your tour one at a time, and Bikely will connect them up and display the distance. You can make notes about each point on the route, and save your route off for everybody else to see. There is a down side - it can make your machine rather sluggish after several hundred points but I suspect that's Google Maps' fault. It'd be much better if the route could snap to roads but, again, that's a Google Maps limitation. (Along the same lines is GMaps pedometer which has been around longer, but is more geared for walking and I don't think offers any advantage over Bikely these days). This one's eye candy. It's exactly as the title says, pictures of fully loaded touring bikes against scenic backdrops. I wish I'd known about this one sooner or I would have taken some suitable pictures last year. Digging through the photographs we did take, I only found one picture of both our bikes up against a wall in France. I submitted it, but it hasn't appeared yet. Apparently it's quite hard to get a picture into this gallery. Hours of entertainment here - various people's accounts of their bike tours all over the world. If you're wishing that hel and dgym would hurry up and post more cycling stories, go here instead and read about other people's adventures, which are probably much more exciting anyway. 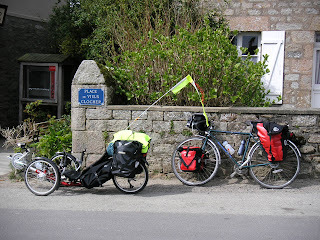 Assorted information about cycle touring in several different European countries. Tells you all sorts of useful things such as what maps to use, how to camp, road conditions, shop opening hours, how easy it is to take your bike on the train, and plenty of useful links. There is also lots of general cycle touring advice. If you're planning a tour some distance from your home and need to take your bike on the plane or train to get there or back, it's worth checking Bike Access for somebody else's experience taking a bike on that airline or train route. There is also a lot of general information about boxing and bagging bikes for transport and the practical issues involved. It's not the best-organised site, but is a goldmine of information. You could combine this with the information on Seat61 to transport your bike hundreds of miles. Not that we're advocating the lazy option or anything. Within the UK, you can also consult the UK Bike/Rail Page. If you live in the UK and want to tour central Europe or beyond, you can either fly there, cycle there or take the train. Flying's no fun, especially with a bike, and you may not have time to cycle there. If you take the train, it's quite likely you'll need to go through France. If you read enough of Bike Access, you'll find out that this is a right pain and the only real way to get your bike on the French trains without too much hassle, is to take the wheels off and bag it up into an housse (pronounced "oose", it's a bike bag. The commercially sold ones are bulky and heavy, so this site gives you instructions to make your own. 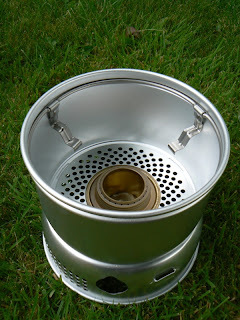 The Trangia 27-1 UL stove arrived last Wednesday in a little brown parcel and it was all very exciting. Unfortunately in all the excitement I had neglected to get excited enough to actually buy any fuel for it, so wasn't able to test it straight away and had to content myself with merely unpacking it, working out what was what, and gazing admiringly at how neatly all the bits and pieces nested together. On Thursday I picked up a good supply of pretty purple juice from the hardware shop and on Friday, a rather bleak and drizzly looking day (hey, this is the summer of grey miserable days, don't you know? 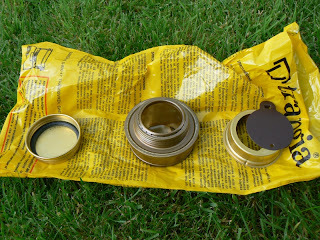 ), I put on my raincoat, armed myself with one Trangia stove + accessories, one plastic camping mug, one Spork (for stirring), one teabag, a small bottle of meths, a bottle of water, a cigarette lighter and set off into the deepest darkest depths of The Garden to boil up a cup of Trangia Tea. The burner (centre) is the core of the system, and that's where the fuel goes. 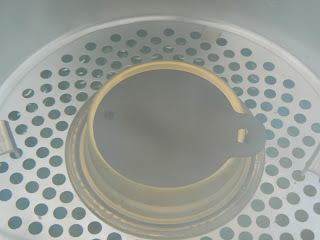 The simmer ring (right) can be placed over the burner and opened to varying degrees for more efficient burning. When completely closed, it can be used to extinguish the burner. The screw-cap (left) allows you to store left-over fuel for next time. This bit keeps the wind off the flame and supports the pans. 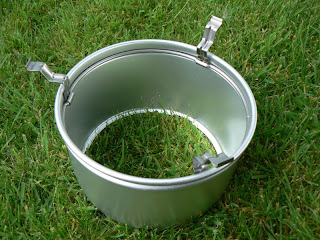 The pot supports are lowered when using the saucepans, or raised (as shown) to support the frying pan. This bit holds up the burner. 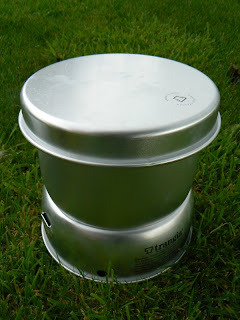 It all fits together to make a stable and windproof stove. I poured a small amount of meths into the burner and added a little water. You're supposed to add 10-15% water to the fuel to prevent sooting - it probably would have been a good idea to have something to measure out the proportions. Lighting the stove was a bit tricky. At the risk of sounding a bit stupid, I spent a considerable amount of time attempting to light the little holes, like you'd do on a gas stove. Ten minutes later I had a sore thumb and an unlit stove. I tried using a bit of paper to transfer the flame but that didn't have much effect either. The instructions on the packaging didn't make it clear exactly how to light the stove, and after much frustration I gave up, headed indoors and searched the internet for more information. 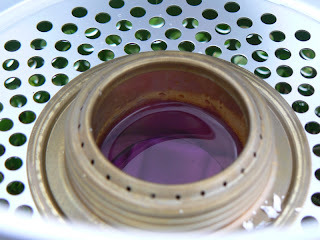 That was when I came across a delightful little page on How to use a Trangia Camping Stove which informed me that, contrary to my instincts, I should just be chucking a lighted match into the little purple puddle of fuel. 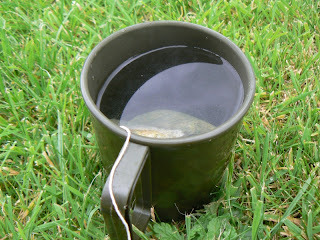 My cup of tea was saved! I didn't have any matches so had to use the lighted bits of paper, and a couple of minutes later my little stove was roaring away. I measured out a cupful of water into one of the saucepans, put it on to boil and covered it up with the frying pan / lid. It took about 3-4 minutes to boil - not the fastest stove in the world but its stability does allow multi-tasking, so I could have made a start on putting up the tent while the water was boiling. At this point, most of the system was quite hot. The upper windshield, pan and lid were all too hot to touch and I needed to use the handle with them (the handle stays off until you need it). The lower windshield was cooler, but with longer cooking it too might have been too hot to touch. 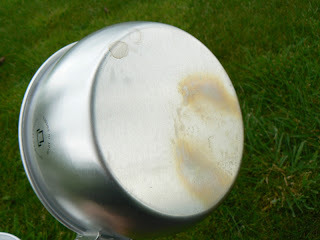 I removed the lid, took the pan off the flame and dropped the closed simmer ring onto the burner - a tricky task as everything was so hot - and left the burner to cool. The cap shouldn't be screwed back onto the burner until it has cooled, otherwise the rubber seal on the cap will be damaged and you'll end up leaking meths everywhere. 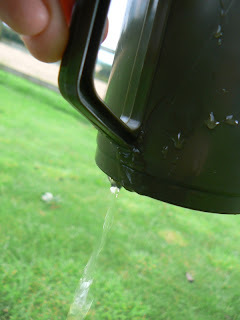 I poured the water into the plastic camping mug and left my cuppa to brew for a few minutes. Examining the bottom of the pan revealed no sooting whatsoever (sooting is frequently reported by Trangia users who don't read the instructions and burn neat meths), just a little discolouration from the heat. Jolly good. 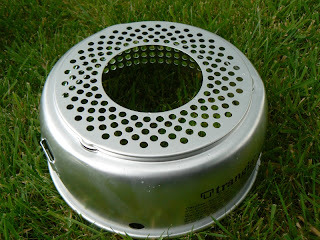 Useful things to consider when using a Trangia. Dilute the fuel with 10-15% water and you'll get a soot-free burn. It might help to have a measuring device. You probably want to do this on the spot rather than pre-diluting the fuel as there's very little point in lugging extra water around when it's widely available and rather heavy stuff. Most of the stove will get hot. Don't touch it, and don't leave the handle on or it'll get hot too. Make sure you've got enough fuel in the stove before lighting it. It's dangerous to add more when the stove's lit or still hot, and you'll have to wait half an hour for it to cool down so you can top it up. 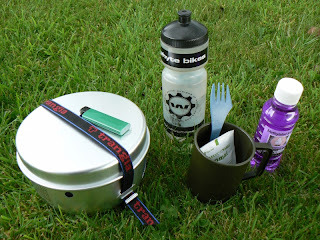 So the stove works great but if anybody feels like donating one of those nice titanium camping mugs, do get in touch.